As a native Hoosier, Dr. Julie Saam is proud of her degrees from only IU campuses. She received a BS in secondary education from IU Southeast, a MS in secondary education from IU Southeast, and a Ph.D. in Science Education from IU Bloomington. Before beginning her tenure track position at IU Kokomo, she taught for 1.5 years at the IUPU Columbus campus. She is currently an Associate professor in the School of Education teaching methods courses in science and mathematics education. She thoroughly enjoys teaching undergraduates and graduates and has been awarded for her teaching with the Trustees Teaching Award, IU Faculty Colloquium on Excellence in Teaching (FACET), and the Claude Rich Excellence in Teaching award. 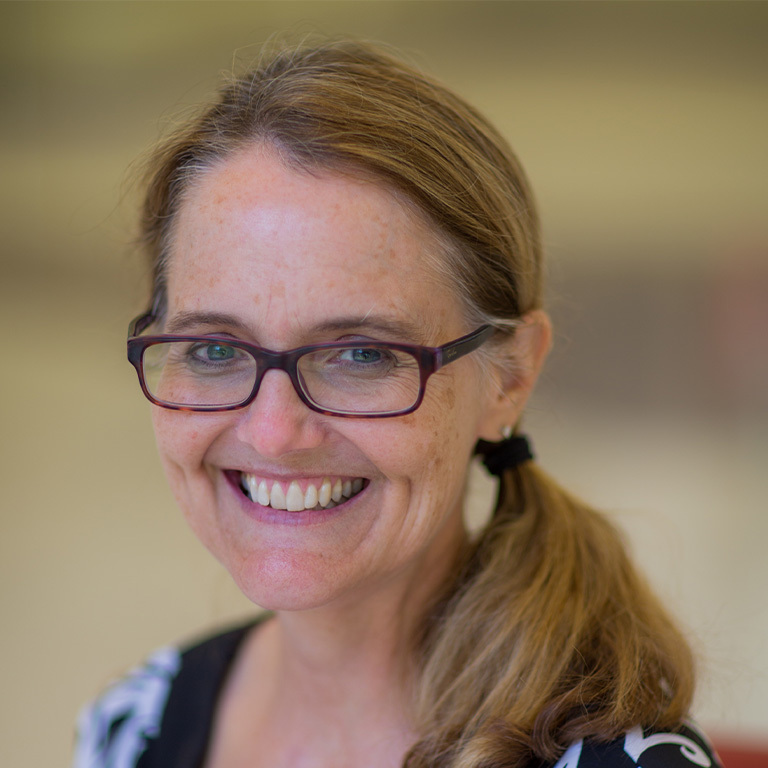 She has also been awarded a Mack Fellowship for her Scholarship of Teaching and Learning (SoTL) research and the P.A. Mack Distinguished Service to Teaching award. She devotes her service time to FACET, Mack Fellows, and as the Qualitative Research Editor for the Journal of the Scholarship of Teaching and Learning (JoSoTL). Her research endeavors are mostly qualitative in nature and investigate such topics as Simultaneous Cross Course teaching, Teacher Education Program Development, and University Faculty Development. Saam, J. & Sorgman, M. >Modeling: A Strategy for Integration in Science and Social Studies Methods School Science and Mathematics Association Annual Convention, November 16, 2007, Indianapolis, IN. Saam, J. & Sorgman, M. >Modeling: A Strategy for Integration in Science and Social Studies Methods> Mid-Western Educational Research Association Annual Meeting, October 27, 2007, St. Louis, MO. Sorgman, M. & Saam, J. (2006 March) Celebrating our students: Exemplars from an integrated social studies and science methods course.Presentation at the 2006 Indiana Council for the Social Studies Annual Convention, Indianapolis, Indiana. Sigler, E., & Saam, J. (2005 February) Teacher candidates conceptual understanding of conceptual learning: From theory to practice. Paper presented at the 2005 American Association of Colleges for Teacher Education Annual Meeting, Washington DC. Saam, J. & Sorgman, M. (2004 February) Enhancing Integrated Social Studies/Science Standards-based Teaching: A Model of Collaboration between University Faculty, Classroom Teachers and Administrators. Paper presented at the American Association of Colleges for Teacher Education Annual Meeting, Chicago, Illinois. Saam, J. & Sorgman, M. (2004 January) Improving Integrated Social Studies/Science Standards-based Teaching: A Professional Development Model.Paper presented at the Association for the Education of Teachers of Science Annual International Conference, Nashville, Tennessee. Sigler, E. & Saam, J. (2002, April). Students’ Conceptual Understanding and Connections between Educational Psychology and Methods. Paper presented at the annual Midwest Conference on the Scholarship of Teaching and Learning, South Bend, Indiana. Saam, J., Boone, W. J., & Chase, V. (1999, January). A snapshot of upper elementary and middle school teachers’ self-efficacy and outcome expectancy. Paper presented at the AETS annual meeting, Austin, Texas. Keating, T., Talbot, R., Petty, M., & Saam, J. (1997, November). A report on the current status of science content in secondary school world-wide-web pages. Paper presented at the annual SSMA conference, Milwaukee, Wisconsin. Chase, V. & Saam, J. (2000). Evaluating for outcomes: Teacher institute evaluation for changes in attitudes.> The Informal Learning Review, (40), 1, 4-5. The Mack Center exists to stimulate inquiry in the Scholarship of Teaching and Learning, to recognize, honor, and increase the influence of that scholarly inquiry, and to foster change with the underlying goal of promoting excellence in education at Indiana University, in the United States, and internationally.